It won't run Crysis, but CompuLab's claims this is the world's smallest dual gigabit Ethernet-equipped PC. 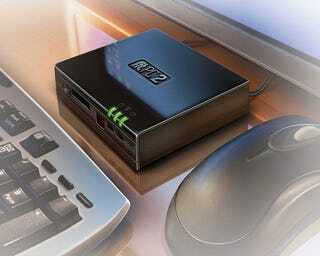 It measures just 4- x 4.5- x 1.05-inches, uses an Atom CPU (1.1GHz or 1.6GHz), and has room for a 2.5-inch SATA hard disk. The die cast chassis weighs only 13 ounces, and features four USB 2.0 ports (2 mini, 2 standard), a miniSD socket, and all the usual audio connections. The fig-PC2i also handles up to 2GB of DDR2 SDRAM, has on-board Wi-Fi, and integrated GMA500 graphics with DVI output (it'll do 1920 x 1200 with an HDMI connector).